I knew Jersey City during the Hague era, having grown up in it. Though just a youth in 1927, I entered independent Republican politics to support my mentor and family lawyer, former Judge Robert Carey, of Jersey City, who the following year was defeated for the Republican nomination for Governor in one of the most hotly contested Primary Elections in the history of New Jersey. In a field of four candidates, Judge Carey lost to State Senator Morgan F. Larson, of Perth Amboy through an electoral sleight-of-hand implemented by Frank Hague. Twenty thousand Democrats, mostly from Hudson County, invaded the Republican Primary to insure Carey’s defeat. The “One Day” Republican scandal rocked the State. It was in large measure responsible for the investigation of Hudson County conducted by a Joint Legislative Probe Committee, of which Senator Clarence E. Case was Chairman and Russel E. Watson was chief Counsel. Case and Watson had been associated earlier as defense counsel for Mrs. Frances Hall in the famous Hall-Mills murder case, in which Hague Democrat, Senator Alexander Simpson, of Jersey City had appeared as the Special Prosecutor. It was also my opportunity to know and to talk with many men who knew Hague in his youth, and to get a first-hand picture of his beginnings. Professor Foster has made a valuable contribution to the Hague saga and to the history of Jersey City in this dissertation. He has done a good job of digging into the misty past to present an account of Hague’s youth and an early period in Jersey City politics. What is needed is a full length, fully annotated biography of Hague, because he was unquestionably one of the strongest political bosses America has ever seen. His influence was state-wide, and as Vice Chairman of the Democratic National Committee, he wielded national influence. Moreover, he was colorful and often resorted to tactics that were unbelievable to most citizens outside of Hudson County. A thorough life of Hague would analyze him psychologically, and present a portrait of this puritanical dictator, who seldom met people informally -- even with most of his close political lieutenants. He was tall, careful of his health, an abstainer from both alcohol and tobacco, free of any known intim.acies with women, save for his wife, aloof and commanding in his bearing, and fastidious in dress. Behind closed doors, Hague could be “rough and tumble” in enforcing his will on subordinates. Yet, Frank Hague was overly dignified in public. He was forceful, yet ungrammatical on the platform. A superb political strategist, Frank Hague was an organizer par-excellence who managed even the smallest details in perfecting his “machine.” Public mass meetings and demonstrations under Hague auspices were extraordinary exhibitions. Governor Franklin D. Roosevelt, running for President in 1932, said Hague’s rally for him on the camp grounds of the National Guard at Sea Girt, N.J. was the biggest and most impressive he had ever witnessed. Jersey City, from right after the Civil War to the present, has been a hot-bed of politics. Corruption was nothing new here, when Hague entered upon the scene. He had grown up in the “Horse Shoe” section, Jersey City’s old Second Ward - an area of tenements and railroad yards, with a saloon on nearly every corner. One of these taverns, at the corner of “Cork Row,” where Hague was born, was run by “Ned” Kenny, father of John V. Kenny, who was to become Hague’s Second Ward leader, and later to overthrow him. It was “Ned” Kenny who picked Hague to run for Constable, and gave him his first campaign money to finance his maiden political effort. “Cork Row” disappeared when the broad highway approach was constructed to the Holland Tunnel. The “Horse Shoe,” so named as the result of a Republican legislative gerrymander, was heavily Irish and Roman Catholic. These poor immigrants and sons of immigrants worked in the railroad yards and on the docks, which were part of the neighborhood. Petty crime flourished, gambling and excess drinking were common, brawls were constant. Yet, the Church exercised tremendous influence over the religiously devout population. St. Michael’s facing Hamilton Square Park was the parish church, and Monsignor Sheppard, its pastor, exerted great influence. It was he who encouraged young Hague; many say the Monsignor was Hague’s closest advisor to the day of his death. Much of Hague’s strength came from the resentment of the poor Irish, who felt that they had been for too long “held down” and exploited by their Protestant landlords and employers, who lived in luxury “up on the hill” in Jersey City’s Bergen section. After a time, they equated being Protestant with being Republican, a misnomer that Hague exploited to the fullest. Plus, the Catholic hierarchy appreciated Mayor Hague’s puritanical crusades to eliminate “houses of ill repute,” the closing of the burlesque show at the Majestic Theatre, opposite City Hall on Grove Street, the elimination of the sale of anything bordering on pornographic, the prohibition of women is saloons (even in the backrooms, entered by what used to be called the “family entrance”), and the banning of dancing in restaurants or night clubs in Jersey City. Favorable sermons were preached from the pulpit of Catholic and Protestant churches, alike. The women gained the right to vote for the first time in a Presidential election in 1920, and though the county went Republican that year, because of the Democratic nominee’s advocacy of the League of Nations (which most Jersey City Irish felt was an Anglican plot to rule the world), the women’s vote went for Hague, thereafter, mostly because of his strong enforcement of all “moral” laws and his insistence that “any man, woman, or child may walk the streets of Jersey City at any hour of the day or night, without fear of being molested.” Hague’s strong-arm police force saw to that. Hague’s rise was phenomenal. Jersey City’s street directory in 1898 has this listing: “Frank Hague, constable, h. 316 ½ Ninth St.” His brothers Hugh, a fireman and John, a watchman were listed at the same home address. Fifteen years later he was a City Commissioner and four years after that he was Mayor of Jersey City. Within a year, he had control of the Democratic organization in Hudson County. Two years later (1919), Hague fielded Hudson’s State Senator, Edward I. Edwards, as a candidate for the party’s nomination for Governor against the powerful and astute James R. Nugent, the boss of Essex County and the heir to the leadership of U.S. Senator James Smith, Jr. When Edwards beat Nugent, Hague proclaimed himself the State Democratic Leader. 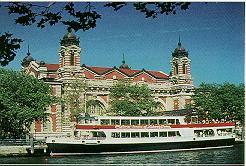 With Edwards installed in the governorship, the “power house” moved from Newark to Jersey City. Governor Edwards proceeded to appoint Judges, Prosecutors, and high state officials recommended by Hague. No political leader in New Jersey history had moved so fast and gone so far in such a short period of time. There had been Democratic leaders in Jersey City before Hague: Robert Davis and Dennis McLaughlin and before them William McAvoy. Governor Leon Abbett (one of the few New Jersey chief executives to serve two terms under the State constitution of 1844, which prohibited a governor from succeeding himself) built a “patronage army” to insure his election to the United States Senate. But when the Jersey City man’s ambition was crushed by the election of Rufus Blodgett in 1887, his supremacy as Democratic boss came to an abrupt end. Hague, alone, became the absolute boss. His dominance reigned from 1917, when he was first chosen Mayor, to 1947, when he retired in favor of his nephew, Mayor Frank Hague Eggers. In fact, Hague was still the power in Jersey City and Hudson County until John V. Kenny toppled the Eggers City Commission ticket in 1949. It was thirty years of uninterrupted rule. When some future writer comes to do the vast research necessary for an in-breadth and in-depth biography, that historian will be grateful to Professor Foster for the conscientious excavation of the past this presentation of Frank Hague’s early years.